In addition to our long list of live shows, Branson has theme parks, attractions, outdoor activities and welcoming accommodations that inspire smiles for miles. With so much fun and entertainment in one place, Branson is the ideal destination for your family’s vacation. Known to many as the “live music show capital of the world,” Branson is home to hundreds of talented performers and a variety of stage shows featuring diverse musical genres – from gospel to rock and everything in between. While Branson’s reputation for fantastic live music is well known – and well deserved – it’s sometimes easy to overlook the fact that Branson has some of the finest resorts, restaurants, golf courses, shopping and attractions in the country. If you’re looking for a family vacation that’s packed with fun and smiles, Branson is the place for you. Need proof? Check out the entertaining experiences waiting for you in Branson. You might want to start exercising those facial muscles. Whether you enjoy jaw-dropping thrill rides, demonstrations by skilled craftsmen, fantastic food or live music, Silver Dollar City generates smiles that last long after the day is over. For more excitement, check out White Water, a great place to beat the summer heat. With thrilling slides, pools and the new Kapau Plummet, you’ll want to spend an entire day there. And don’t miss The Tracks Family Fun Parks, for a day full of go-karts, mini-golf, laser tag, arcade games and more. One of the best things about vacation is taking time to do a little shopping. A wide range of choices at Branson Landing, Tanger Outlets and Grand Village Shops are sure to bring a smile to any shopper's face. There’s something for every palate in Branson. Experience fine food and heavenly tastes at Devil’s Pool Restaurant at Big Cedar Lodge, sample fantastic barbecue and mouthwatering burgers at Danna’s Bar-B-Q and Burger Shop, or get a taste of Mexico at Cantina Laredo, a popular place to enjoy a drink whether you’ve spent a long day taking in the sights or taking advantage of outdoor activities. Whether you’re taking in the scenic beauty of Table Rock Lake, angling for trout on Lake Taneycomo, taking a zip line ride at Wolfe Creek Preserve or simply marveling at the beauty of the Ozark hills, there are plenty of reasons to smile together when enjoying the outdoors in Branson. Golf courses in Branson have been making golfers smile for years. Its little wonder area courses are consistently ranked as some of the top public courses in Missouri. In fact, Branson Hills Golf Club was named the state’s best course in 2012 and 2013 by Golfweek magazine. Elsewhere around Branson, check out Thousand Hills Golf Resort, Pointe Royale Golf Course and the Buffalo Ridge Springs Course. Go back in time at the Titanic Museum Attraction in Branson. With artifacts and personal stories recovered from the ill-fated luxury liner and her passengers, it truly is a can’t-miss destination. From the Titanic Museum, it’s just two minutes to Branson’s Hollywood Wax Museum, where you can get photos with everyone from movie stars like Brad Pitt to famous film villains like Count Dracula. Enjoy a taste – and a tour – at Curling Vine Winery, a name that’s been synonymous with wines in Missouri since the mid-1800s. And speaking of taste, don’t miss Copper Run Distillery, in Walnut Shade, the first distillery in the Missouri Ozarks since prohibition ended in 1933. They specialize in moonshine, whiskey and rum, for those older than 21, of course. After a long day of fun, there’s nothing better than a relaxing swim, warm shower and cozy bed. There are thousands of rooms available in Branson; the difficult part is choosing where to stay. Pamper yourself with a night at Chateau on the Lake and enjoy stunning views. Stay in the heart of downtown at Hilton Promenade at Branson Landing or treat the family to a weekend at Grand Country Inn. For shopping, shows, family fun and a massive breakfast buffet, check out Welk Resort. 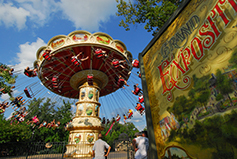 Discover even more options for your family fun vacation in Branson here.